I have a bit of dilemma: I so love menudo, but I am fussy about where I get the menudo that I eat. Alright! So they do serve menudo often enough at the cafeteria. If I care to, I can also always get it as well at Pangga’s, this turo-turo style fastfood joint where I often eat before going home. I rather tend not to, though. Order, that is. The menudo they offer in both places is the wet type, which so turns me off. Oh, I can eat that type, fair enough! But I am so old-school in many ways, so I will never get as much pleasure eating menudo unless it is dry and has that smoky flavor that can only be had if it has been cooked in a large vat over a wooden fire. In short, the sort of menudo one gets in a piyestahan. Now, here lies the next dilemma. I gave up going to fiestas a long time ago. To do so often means getting stuck in traffic, walking the streets under the burning sun and avoiding troublesome drunks along the roads. Practical that I have always been, my solution to the dilemma is really quite obvious, if a little lacking in dignity – I beg! Sometimes, I get lucky and the people I beg from actually do remember. If they don’t, I can always beg again! Well, this morning was one of my lucky days! One of my friends – I must have begged before – remembered and brought me my favorite menudo in a plastic container. I did not even know that it was fiesta yesterday at his place. I would have jumped for real joy, but that would have lowered my dignity even further. Need I tell you that, as I type tonight’s entry, half the menudo is already being broken down by enzymes inside my stomach? Whatever gases are produced I happily burp – excuse me – into the night air, happily tasting the menudo flavors all over again. There is a childhood hang-up here somewhere; that, I am sure of! In the old days, preparing for the fiesta was always a social event. The kamag-anaks came to help, and sometimes they brought the cocinero with them as well. We all woke up early on the eve of fiesta because Pedro had to be put to the sword for the crime of being four or five months old and for having the right mix of fat and sinew. By the way, Pedro was the pig. By mid-morning, all the sangkalans were placed atop the table and all the kamag-anaks pitched in slicing Pedro’s meat down to the sizes dictated by each putahe. 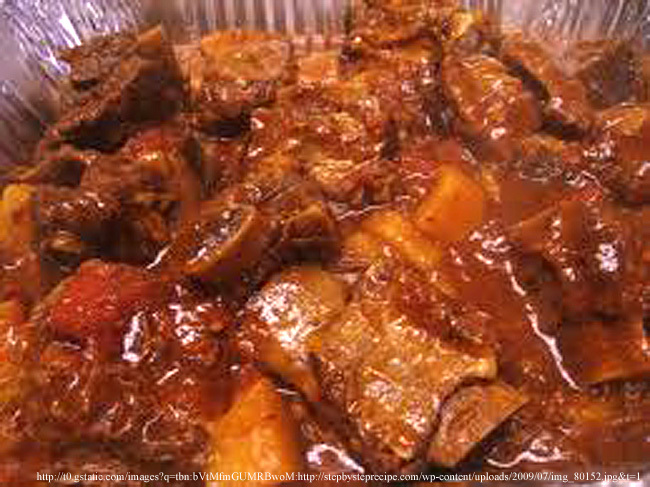 The slices for the menudo were always among the hardest to do because they had to be as small as fingernails. Nobody complained, though, because clan gossip was being exchanged throughout the exercise. I was never really asked to help – there were enough relatives to do the slicing. But I used to hang around the table, nonetheless, because the banter was lovely to listen to. Outside, the firewood was being lit and the fires soon stoked. When I got tired listening to the gossip at the slicing table, I went outside to listen to the cocinero. He himself had tons of stories to tell. Whoever the cocinero was, he always left it to my uncle to do the kaldereta. 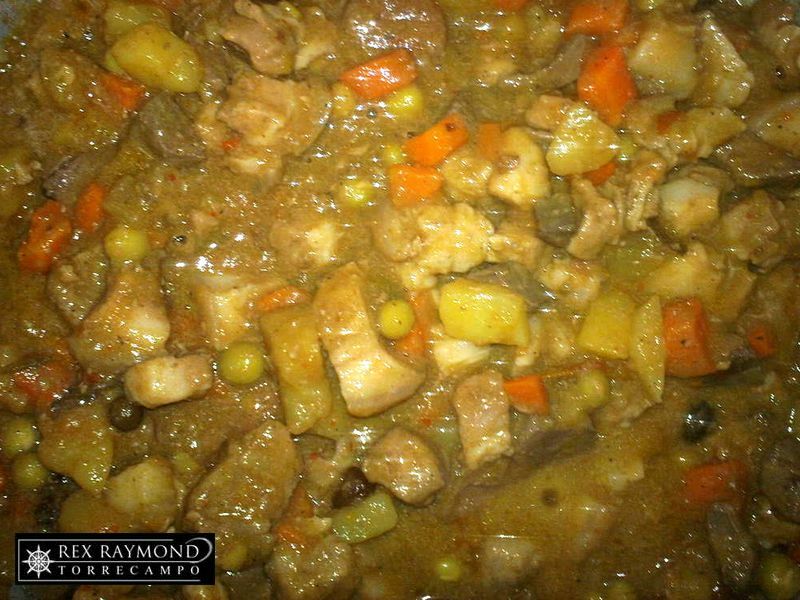 Nobody – repeat, NOBODY – beat my uncle at cooking kaldereta. That was an accepted fact as irrefutable as the fact that we need to breathe air to live! The one reason why I do not pine for kaldereta as much as I do for menudo is that anyone else’s but my uncle’s – I always thought – tasted inferior. 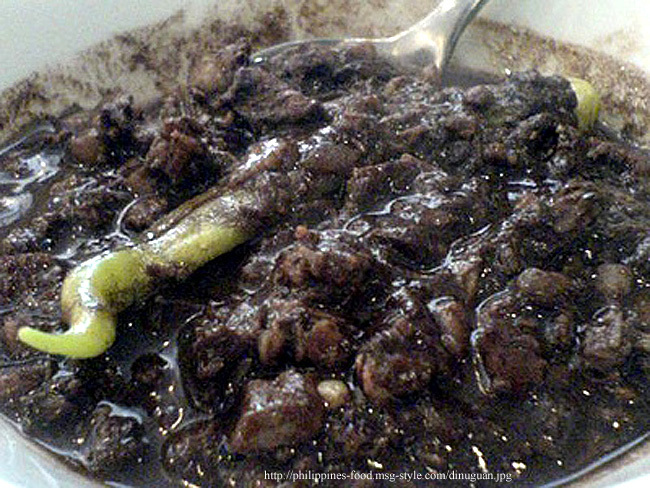 One of the things that really turns me off other people’s kaldereta is the anggo. This, my uncle’s version never was. I am not sure what his secret was; albeit, we all suspected it was the gin he continually laced the kaldereta with while it simmered. Privately, we also all wondered which would get drunk first, the kaldereta or my uncle. And not that we ever minded if it was my uncle… In fact, we used to almost ritually gather around the vat when my uncle’s state of inebriation had escalated because he was this jolly old character whose tales became funnier the more swigs of gin he took! Dinner-time on the eve of fiesta was always much-anticipated. It was when the household could – at least – eat properly, something difficult to do on the day of the fiesta when there were so many people in the house and so many things to do. The usual fiesta fare was still being cooked, but for the night before, there was already some inihaw or dinuguan. The latter, my Mom was particularly meticulous in preparing. She would wash Pedro’s intestines two or three times with Tide and rinse these properly so that there was no stomach-y smell left after it was cooked. 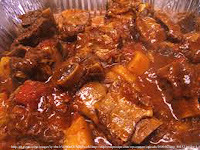 On the day of the fiesta itself – never mind if there was adobo, estufado, morcon or what have you on the table – when Mom hollered for us to get something to eat, I would just ignore everything else for when there was more quiet in the house – but make sure the menudo got some attention.